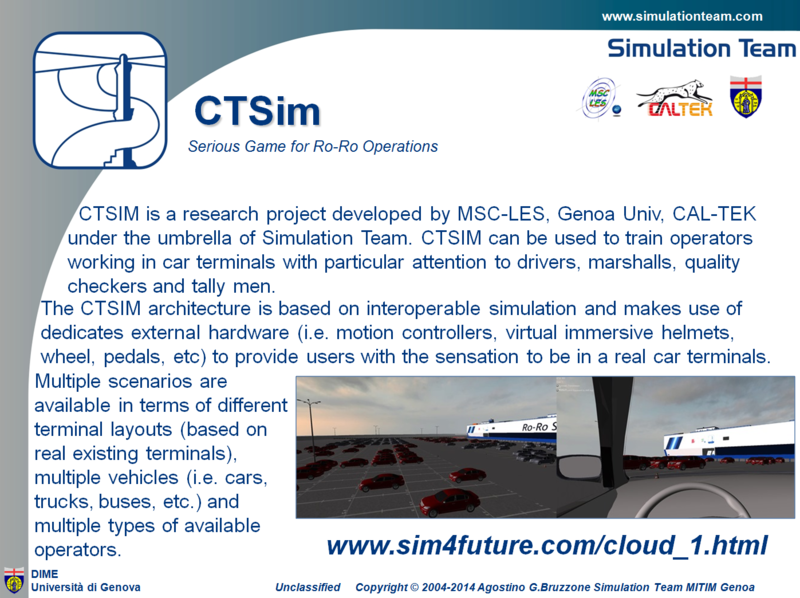 CTSIM is a research project developed by MSC-LES, Genoa Univ, CAL-TEK under the umbrella of Simulation Team. CTSIM can be used to train operators working in car terminals with particular attention to drivers, marshalls, quality checkers and tally men. The CTSIM architecture is based on interoperable simulation and makes use of dedicates external hardware (i.e. motion controllers, virtual immersive helmets, wheel, pedals, etc) to provide users with the sensation to be in a real car terminals. Multiple scenarios are available in terms of different terminal layouts (based on real existing terminals), multiple vehicles (i.e. cars, trucks, buses, etc.) and multiple types of available operators.